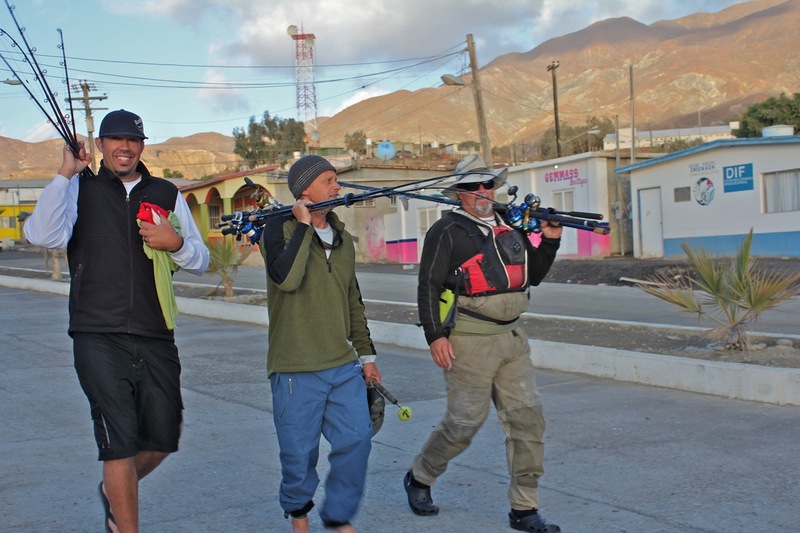 Below is an article I wrote for Pacific Coast Sport Fishing about our trip to Cedros Island to shoot an episode of The Kayak Fishing Show with Jim Sammons. Along on the trip were my good friends Matt Moyer, Mark Olson and Jose Angel, owner of Cedros Outdoor Adventures. This episode will air later this year. Matt Moyer, Mark Olson and Jim Sammons all headed to the water to fish. On the trip we were all rigged up the new Okuma rods and reels including the Cedros lever drag, Star drag and new low pro bait casters. The reels were all loaded with Seaguar Kanzen braid with Seaguar flourocarbon leaders. 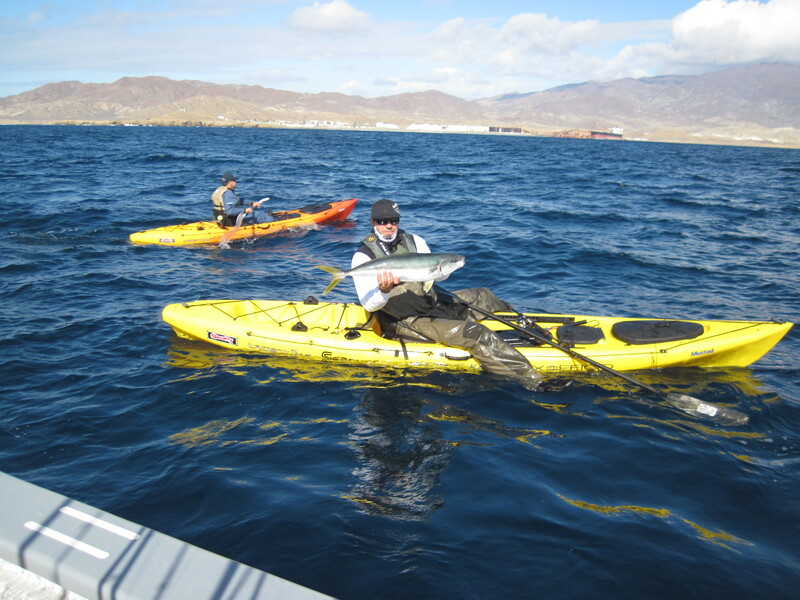 The kayaks available at Cedros are Ocean Kayak Trident 13′ all rigged with Scotty rod holders. Of course I am always wearing the best sunglasses available by Maui Jim and clothing by ExOfficio, particularly their Sol Cool shirts. Thanks to these companies for their never ending support. Have you have ever wanted a glimpse of what the fishing was like along the California coast in years gone by? 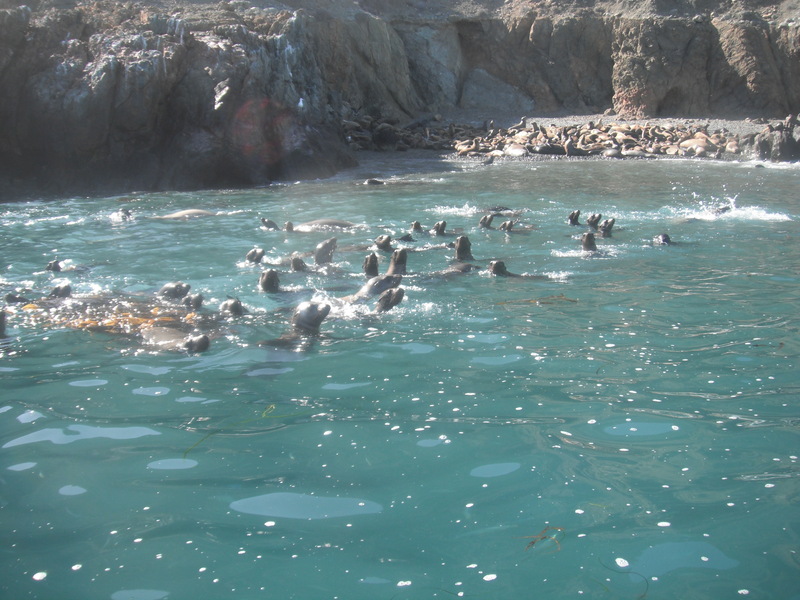 If so one of your best options is to hit the waters off of Cedros Island in Northern Baja. Because the island is out of reach for most recreational anglers, being 310 miles south of San Diego and a long panga ride from the Baja coast, you get a real feel of what our fishing was like back in the Good ole days. Some of the Locals hanging out. 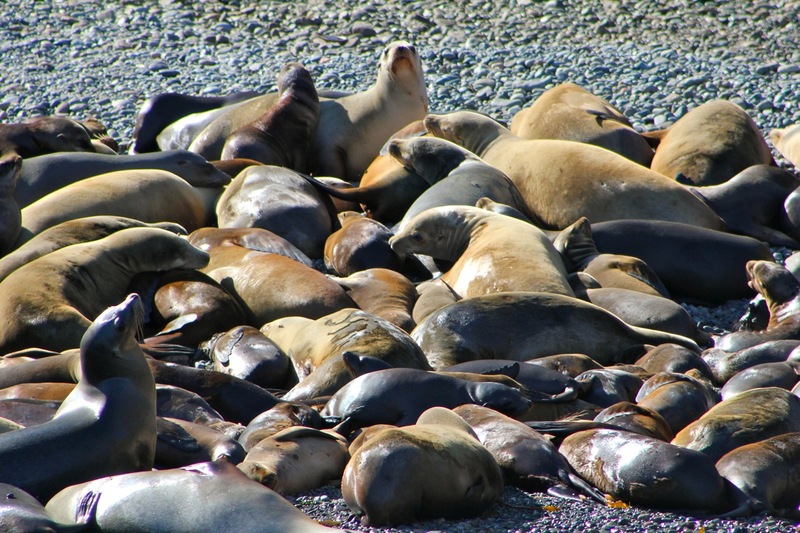 Elephant Seals, Sealions and Seals all shared this beach. 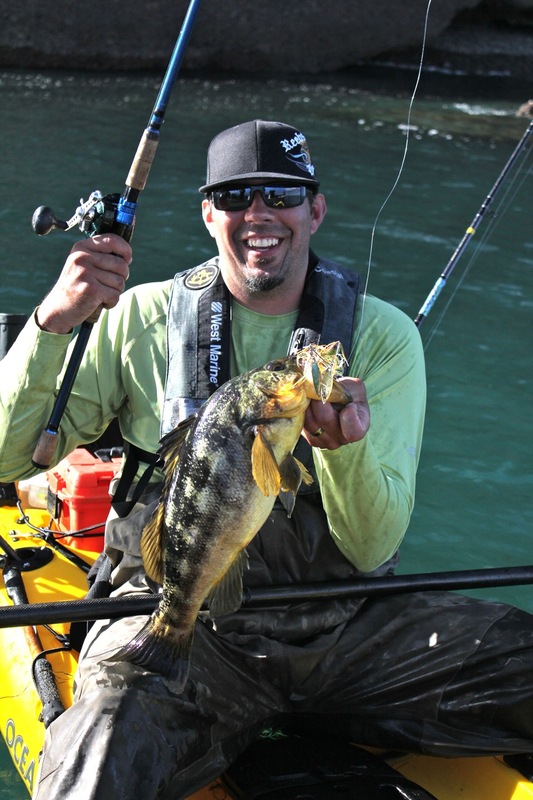 At Cedros Island, deemed by some to be the Yellowtail capital of the world, yellows are certainly a prime target but you will also experience Calico bass fishing unlike you have ever seen as well as shots at big Grouper, Halibut and much more. We caught a bunch of these scrappy little yellows and got busted off on some bigger ones. 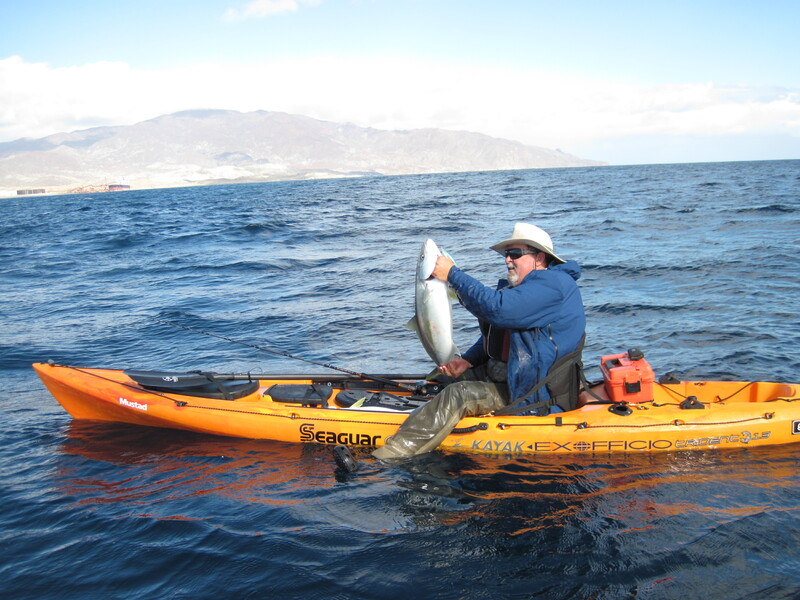 For those kayak anglers wanting to experience the great fishing that Cedros Island has to offer, the question is how to get there. 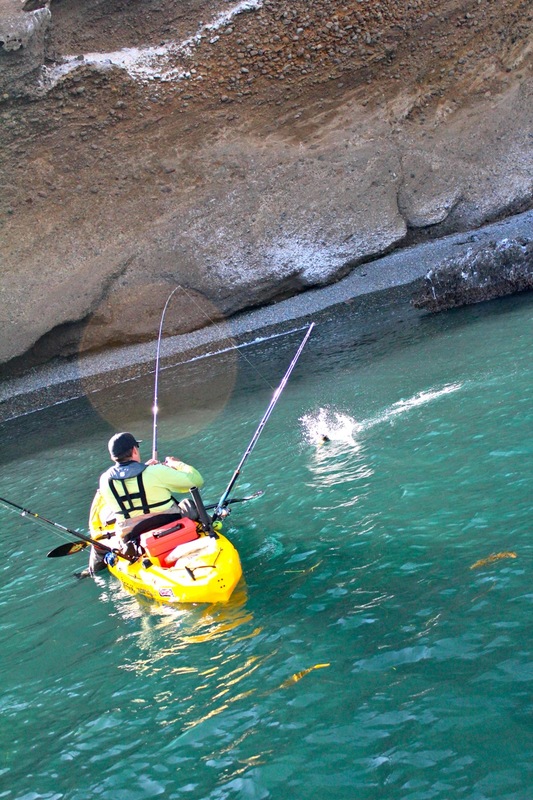 Until recently kayak anglers had only a couple options; The first option and likely the most daunting is to drive down the Baja coast, then hire a Panga out of Bahia Tortugas for what can be a rough ride to the island. 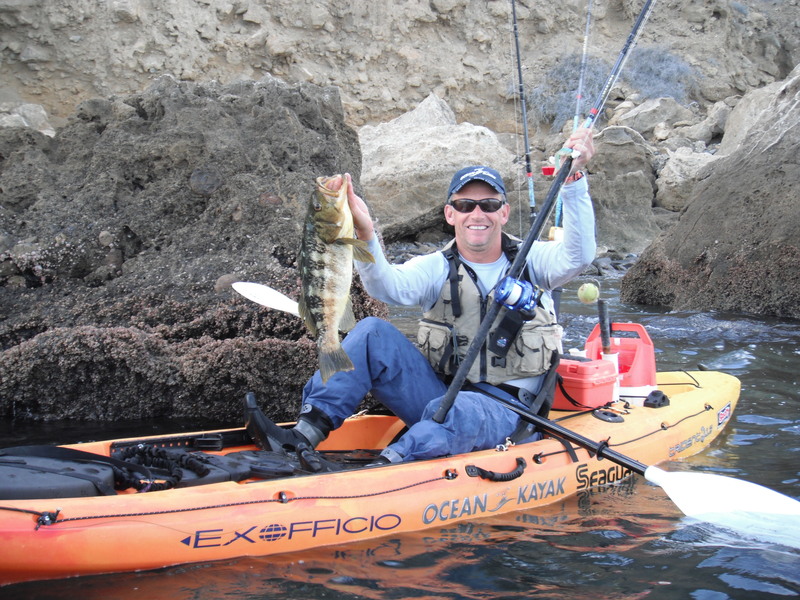 The next option, and one I have done a couple times, is to jump on one of the long range boats out of San Diego that specialize in skiff and kayak trips. The Q105 and the Islander both run such trips and though a great time they involve a minimum of a six day commitment, sixty hours of which is travel time in what can be very sloppy seas. 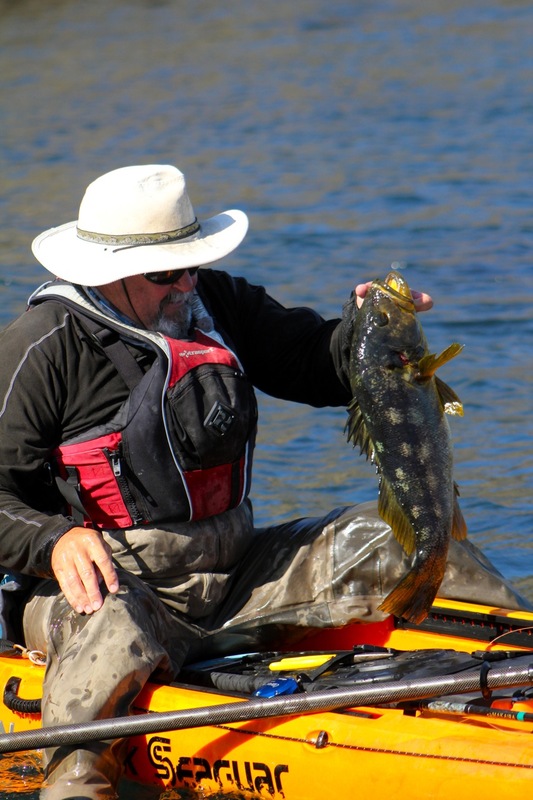 A new option for kayak anglers wanting to visit Cedros, and one I just had the pleasure of doing, is a fly down trip with Cedros Outdoor Adventures. Jose Angel Sanchez the owner of COA and your host takes care of every detail to make this trip as easy and seamless as possible. With trips from three to five days of fishing they have a package to fit your schedule. The trip begins when you are picked up in San Ysidro by a professional driver in a very nice van chartered from Hotel Coral and Marina. 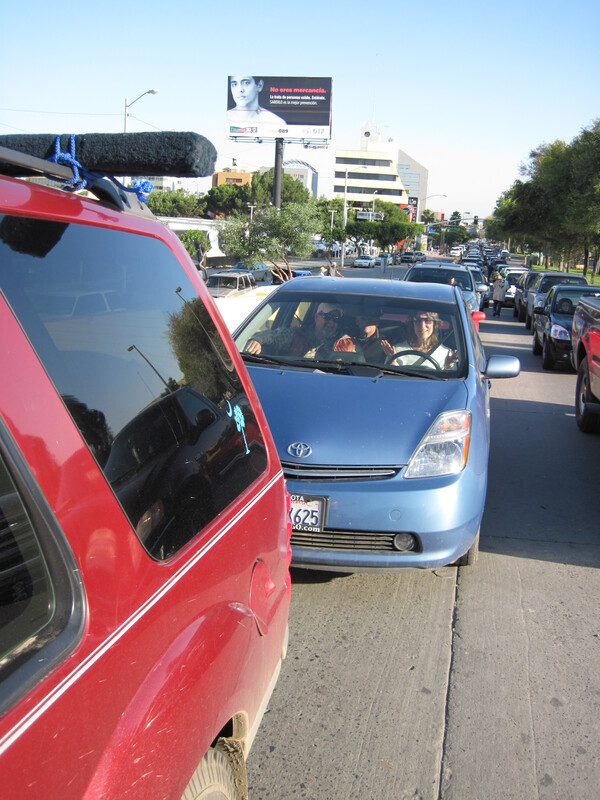 You will make a quick stop at the border to pick up your tourist visa which costs about $23, don’t forget our passport. A short two hour drive down the beautiful Baja coast to Ensenada brings you to the airport where you will board a Cessna Grand Caravan for the hour and forty five minute flight to Cedros Island. After your second baggage search of the day you will have a ten minute drive to the Hotel Zam-Mar your residence for the trip. Now I will admit driving up the narrow road and alley way to the hotel, I was not expecting too much. To my surprise and pleasure this family owned hotel is real nice with all the rooms newly renovated, comfortable and very clean. For those that need to stay connected there is wireless internet and satellite TV. There is a patio for relaxing and barbeques where they will prepare your fish for you and an on premises restaurant. The included food is delicious, prepared local style, and features lots of fresh sea food. The proprietors really do everything possible to make your stay comfortable and fun, often sitting and chatting with you about your fishing day and sharing information about the island. Spending a bit of time at the hotel to unpack and rig your fishing gear you are soon whisked away to the harbor to get in some fishing time on the first afternoon, which depending on the time of year can be many hours. You will have long days on the water with a normal fishing day going from 6:00 am to 6:00pm, with lunch on the boat or for those that choose an afternoon break and lunch back at the hotel. With great fishing just outside the harbor, maybe a five minute paddle, and fish to be had all along the island a person could easily do the trip as an unguided paddle only trip, which is offered, but if you really want the chance to get on a lot of fish and the opportunity to see more of the island I encourage you to go with the panga supported guided trip. Plain and simple this just gives you more fishing time and less paddling time, not to mention a nice place to toss some of the yellowtail you will want to keep and a bait tank if you choose to live bait fish. Another option is to have Jose drop you and the kayak off at a spot in the morning and you spend the day fishing your way back to the hotel. COA will put together a trip that most appeals to you. 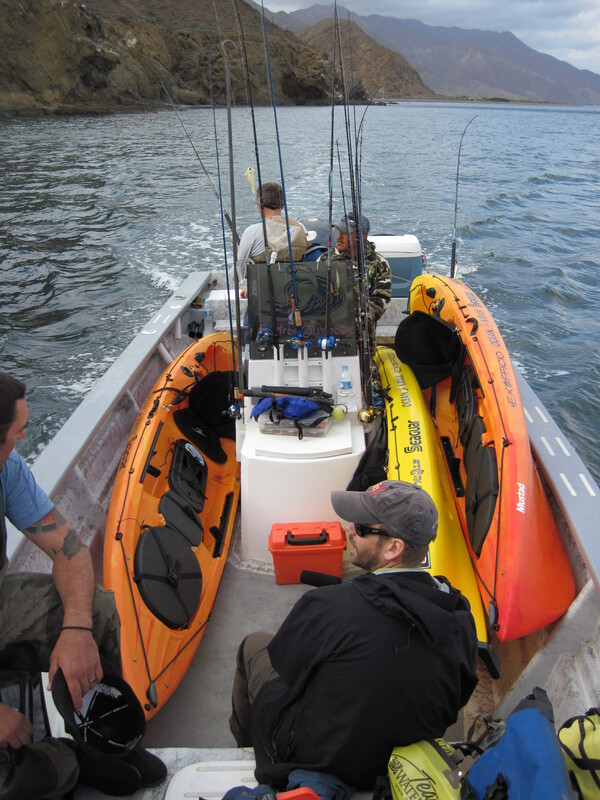 We are shooting a TV show, we need a boat, and it gives you much more range, but many good fish are a short paddle from the beach. 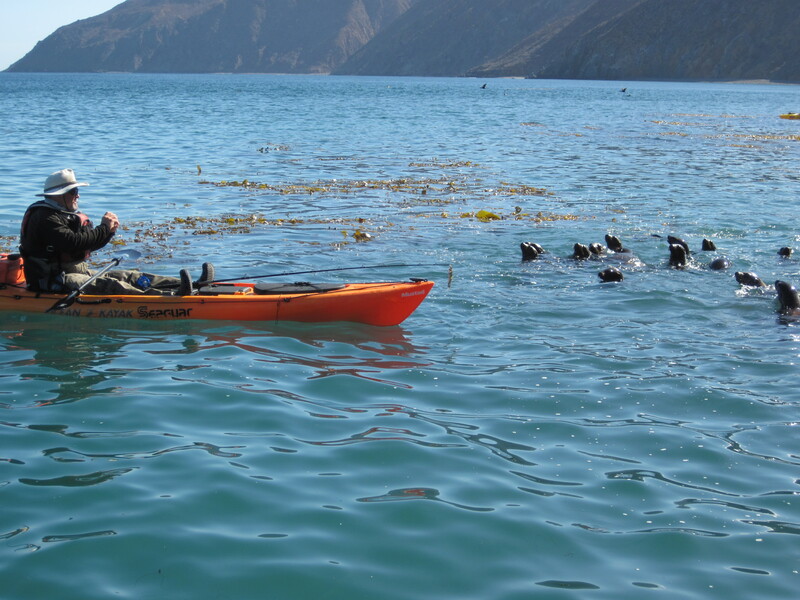 Cedros Island Adventures has several brand new Ocean Kayak Tridents, outfitted with four rod holders, seats, PFDs and paddles so all you really need to bring is your fishing gear, though I always bring my own Werner paddle on trips. You are limited to 50 pounds of gear on the plane so you may want to trim down your gear a bit. If you plan on fishing for a variety of fish from Yellows to Calicos I think a good quiver of rods for the trip would include a stout bass rod, Jig stick, yo-yo rod and live bait/trolling rod. You are allowed rods up to eight feet on the plane which are run down the aisle of the plane, NO rod tubes, so make sure your rods are bundled together. There is a lot of structure and kelp at the island so fishing braid is a very good idea, on this last trip I was fishing straight 60lb Kanzen for the calicos, these fish were voracious and not line shy. There are also some brute yellows there so don’t be afraid to fish heavy line and tight drags or you will get rocked. If you like to fish for Calicos you have come to the right place, the quantity and quality of these fish at Cedros Island will blow you away. You can catch them deep or shallow, in the kelp or over shallow structure. 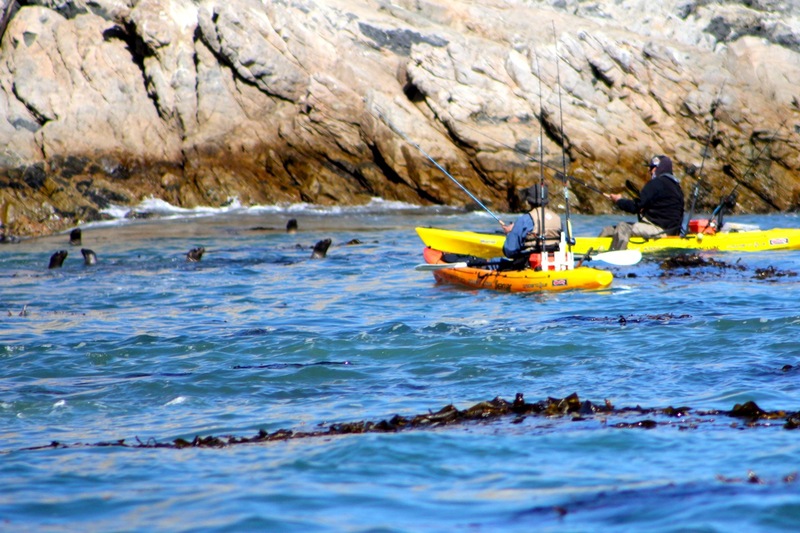 Of course using the kayak to get to spots that are deep in the kelp or in close to the rocks will help you catch even more and bigger fish. I know a lot of guys like to fish soft plastics for Calicos but if you do be prepared to burn through a lot of them. On our trip my go to lure was a hard jointed bait from Savage gear, this shallow running suspending bait would draw crazy surface blow ups while fishing the shallow structure, while my fishing partner Matt Moyer crushed big numbers of bass while fishing spinner baits. By fishing these hard baits we were able to spend more time casting and less time swapping out tails. If fishing the kelp fishing weedless is key and a jig head like the Reebs Kelp assassin will save you a lot of aggravation and help you get more fish. If you are going to spend much time fishing the bass be sure to bring some thumb tape, you will certainly need it. Matt crushed the Calicos on the Reebs Spinner bait. 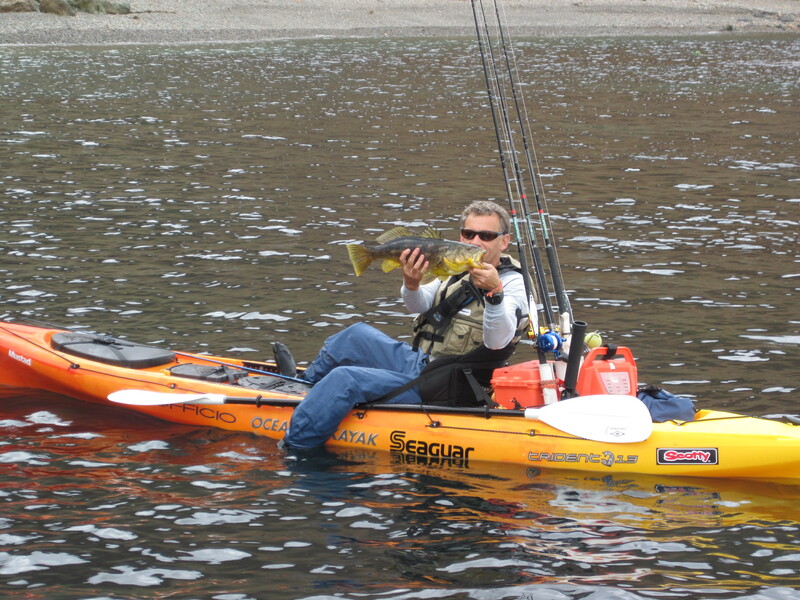 You can follow Jim’s kayak fishing exploits on The Kayak Fishing Show with Jim Sammons on WFN (www.kayakfishingshow.com), or visit his web site www.JimSammons.com to learn about his guided kayak fishing trips in San Diego and Baja and everything else he is up too.